In a zip lock bag add all the dry spices and shake it well. Pierced the chicken pieces well with fork for all the spices to blend in. In the zip lock bag add ketchup, curd, ginger garlic, and oil and lemon juice. Shake it well and then add chicken pieces. Toss it well with tongs and let it marinate for 4-8 hrs or overnight. Preheat the oven at 350 for 10 minutes. Take the foil paper and set the grill on it. Take out the chicken and let it sit on grill for 5 minutes so that juices come down on foil paper. Now grill the chicken for 40-50 minutes, until it is golden brown. Serve hot with pudina/mint chutney, onion rings and lemon wedges. Wonderful Kebab . Thank U . A very yummy & good recipe. thanks 4 sharing Chitra. 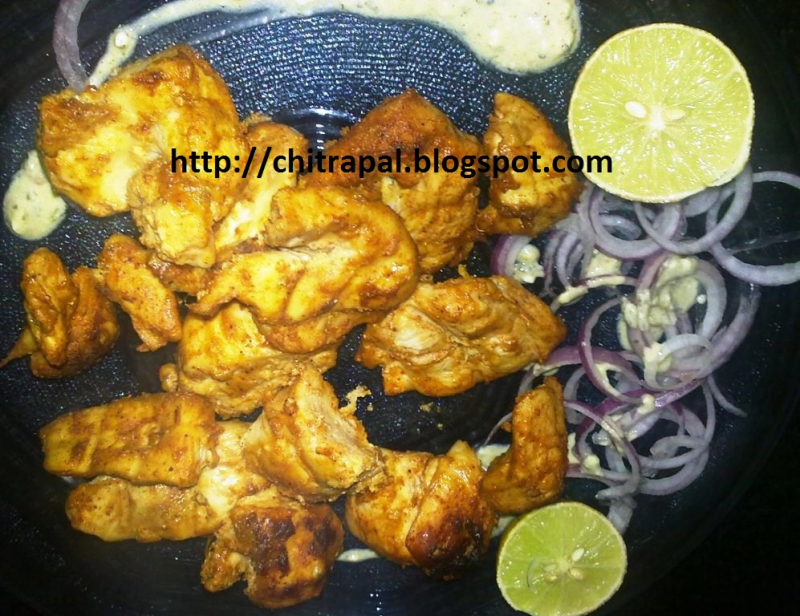 A very Healthy recipe thank you Chitra ji.